Because of the “new attack” which is being mounted today against Joseph, I thought it would be interesting to discuss a Book of Mormon scripture which is pertinent to this issue. But a seer will I raise up out of the fruit of thy loins; and unto him will I give power to bring forth my word unto the seed of thy loins…. And out of weakness he shall be made strong, in that day when my work shall commence among all my people, unto the restoring thee, O house of Israel, saith the Lord. And thus prophesied Joseph, saying: Behold, that seer will the Lord bless; And they that seek to destroy him, shall be confounded: For this promise, of which I have obtained of the Lord, of the fruit of thy loins, shall be fulfilled. Behold, I am sure of the fulfilling of this promise. And his name shall be called after me; and it shall be after the name of his father. And he shall be like unto me; for the thing which the Lord shall bring forth by his hand, by the power of the Lord shall bring my people unto salvation; Yea, thus prophesied Joseph, I am sure of this thing, even as I am sure of the promise of Moses: for the Lord hath said unto me, I will preserve thy seed for ever. This scripture is part of Lehi’s blessing to his son Joseph where he quotes the prophecy of Joseph of old, the son of Jacob or Israel. 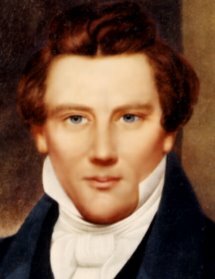 The above scripture is Joseph’s prophecy about Joseph Smith, Jr. There are two parts to this scripture I wish to discuss. Since Joseph is in his weakest position ever, the Book of Mormon scripture quoted above applies to today but is yet to be fulfilled. Those of us who believe he was not a polygamist, but an honorable prophet of God, can take great hope. For "out of weakness he shall be made strong." The fullness of the gospel restored through him will again go forth in power to the convincing of many of its truth. As a result, Joseph's name will no longer be “had ... for evil” but will be “had for good.” And when this happens God will begin to restore the house of Israel to the promises He made with them. Second, the scripture says, “And they that seek to destroy him, shall be confounded: For this promise ... shall be fulfilled.” When the time comes that God makes Joseph, and the gospel restored through him, strong again, those who have sought to demean his character and his work "to destroy him" will no longer be allowed to do so. Their mouths will be shut and Joseph and the work he did will be honored in power by the Spirit of God to bring the house of Israel back to the true and living God. This of course will take place at the great and last gathering under the power of the endowment. While those who seek to destroy Joseph will have their pleasure for a while, Joseph’s name and his work will eventually triumph by the power of God. where men conspire against Joseph Smith to turn Great and Marvelous Work upside down. I believe they also point in a similar direction as your post scripture. Thanks for the scriptures and your encouragement! I look forward to the day when his name will be cleared of the polygamy defamation.